Peter Scott-Morgan, former colleague of mine and a mercurial mind in so many dimensions, was relatively recently diagnosed with motor neuron disease (MND or, more popularly known as ALS or Lou Gehrig’s disease. Steven Hawking had a slow-moving version of this disease. Charlie Osborne, a friend and fellow doctoral student of mine, died from it.) A devastating blow to anyone, Peter has, not unexpectedly, turned this into an opportunity to explore technology as a way of staying connected with his surroundings. MND gradually shuts down the communication system between your body and your brain, and can leave you trapped with a fully functioning brain locked inside a body you cannot control. Peter, who has a Ph.D. in robotics and energy enough for a platoon, aims to do whatever he can to stay not just alive, but communicating and functioning, as long as possible. To do this, he has had several operations to facilitate technology access to his body and continued functioning (you eventually lose control of the smooth (involuntary) muscles as well as the regular ones) after his brain stops communicating naturally. Dr Peter Scott-Morgan on Vimeo. In order to install and to a large extent develop this technology, he needs help finding people with expertise and interest in developing new technology using him as the experimental subject and development partner. Peter is no stranger to being a pioneer – him and his spouse Francis Scott-Morgan were the first gay couple to be married in a full ceremony in the UK in 2005. This entry was posted in Amazing, Up close and personal on August 8, 2018 by Espen. 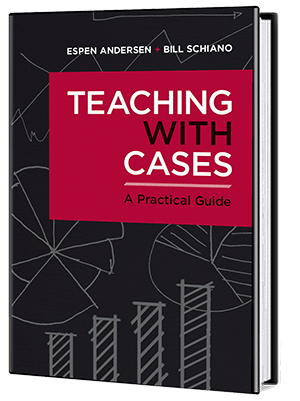 Check out Teaching with Cases: A Practical Guide , written with Bill Schiano. You'll find more information here.